Alpha is an 11-week series of sessions exploring the Christian faith that has touched the lives of over 29 million people spanning 169 countries and 112 different languages. Each weekly meeting looks at a different question based around faith and is designed to create conversation in a safe, non-threatening environment. 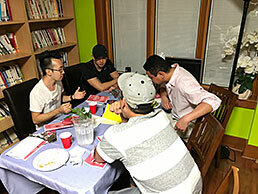 Alpha can be run in cafés, churches, universities, homes – anywhere. And the beauty of Alpha is no matter one’s background everyone is welcome; whether you’re a long-time Christian, new Christian, or non-Christian, all are invited to take part in Alpha. Although no two Alphas look the same, there are generally have three key things in common: food, a talk, and discussion. Almost nothing brings people together quite like food. And that truth is not lost at Alpha. 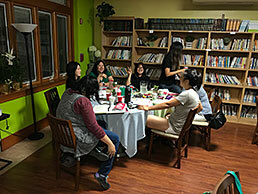 Each session starts with food because it's a great way to build community and get to know each other. The meals are 100% complimentary and provided each week to all participants. Following the meal, a different weekly video will be played focusing on a new theme for that session. These talks are designed to engage and inspire conversation within each group. They explore the big issues around faith and unpack the basics of Christianity, addressing questions from WHO is Jesus? And HOW can we have faith? To WHY and HOW do I pray? And HOW does God guide us? The most important part of any Alpha is the final portion of each session: discussion. 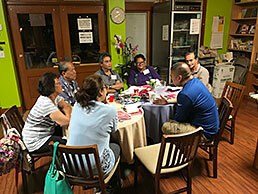 The discussion provides each participant the chance to share thoughts and ideas on the talk topic, and simply discuss them in their small group. There's no obligation to say anything and there's nothing that is off limits. It's an opportunity to hear from others and contribute your own perspective in an honest, friendly and open environment. For more general information on Alpha, please visit https://alpha.org/ or please contact, Jon Hanai (jon.hanai@gmail.com), with any questions.